The history of Limousin cattle may very well be as old as the European continent itself. Cattle found in cave drawings estimated to be 20 000 years old in the Lascaux Caves near Montignac, France have a striking resemblance to today’s Limousin. These golden-red cattle originated in the West of the Massif Central between Central and South West France, a rather rainy region with harsh climatic conditions and poor granite soil. It was in these unfavourable conditions that the breed developed. As a result of their environment Limousin cattle evolved into a breed of unusual sturdiness, health and adaptability. This lack of natural resources also enabled the region to remain relatively isolated and the farmers free to develop their cattle with little outside genetic interference. 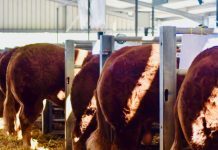 Since those early days the breed has developed from a working meat animal into a highly specialised beef producing animal with a well muscled carcase without excessive fat cover. Today, Limousin cattle are still referred to as the “butcher’s animal” in France. 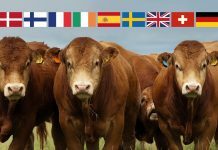 Increasing demand for quality beef production has witnessed the breed becoming established all around the world including Spain, Portugal, Italy, Germany, Belgium, Holland, Denmark, Sweden, Ireland, Hungary, Russia, South Africa, USA, Canada, Brazil, Argentina, Venezuela, Uruguay and Zimbabwe. In February 1971, 179 pure-bred bulls and heifers arrived at Leith Docks in Edinburgh. The excellent qualities of the breed such as easy calving, hardiness and their ability to produce well marbled quality meat with a low proportion of bone and fat was so impressive that demand grew rapidly. By 1986, only fifteen years after the breed was first introduced to the country the Limousin took the number one beef A.I. position nationally and knocked the traditional Hereford into second place. The Limousin still holds this position today. 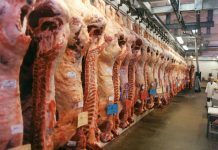 Meat and Livestock Commission carcase evaluation figures confirmed that of all the main beef breeds in this country, the Limousin has the ability to produce more saleable meat in the high price cuts along with the top killing out percentage. The breed is well suited to the market, which demands a consistent, quality, lean beef product. Limousin bulls have proved to be extremely fertile and their conformation is passed on to all progeny whilst their lighter frame ensures ease of calving. Limousin females pure and cross-bred have demonstrated high fertility, a good milking ability, high conception rate and ease of calving. Naturally hardy and thrifty the females are smaller than most continental suckler dams allowing for increased stocking rates. Limousin cattle can be seen at all the major agricultural shows in the UK. 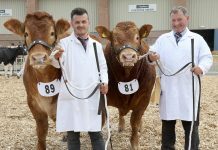 At the Royal Smithfield Show, the UK’s Premier Fatstock event the Limousin cattle and carcases have dominated the catalogue and the competition, re-enforcing its claims as the Carcase Breed. 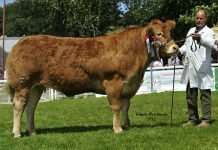 Similarly the breed has enjoyed considerable success at the Scottish Winter Fair, the Birmingham Primestock Show, the Royal Welsh Winter Fair and the Ulster Beef and Lamb Championship winning the Grand Slam in five out of the last eight years. In December 1998, figures released from the British Cattle Movement Service confirmed that the Limousin became the largest numerical beef breed in the UK, a position it still holds today.